sweet and savory ways to incorporate this protein-packed superfood into your morning meal. Quinoa is actually a pseudocereal that contains all the essential amino acids. First off, it’s pronounced keen-wah (not kwi-no-ah or kwin-wah). Secondly, and more importantly, yes, quinoa is delicious and can be adapted into sweet or savory options. Since quinoa has such a high protein content, it’s an ideal breakfast ingredient to give you energy and stamina throughout the morning. We’ve included recipes for when you are cooking for a crowd, need breakfast on the go, or want a special first meal of the day that just happens to have some healthy components. It’s important to wash quinoa before preparing (unless specified in a recipe or the quinoa is already pre-rinsed). Swishing the quinoa around in a pot or bowl and then draining off most of the water removes the bitter coating on quinoa. Beyond that, we encourage you to experiment with this superfood, subbing it in for your favorite grain in recipes you already love or trying out any and all of these 17 suggestions. Simple and sweet is our breakfast motto: if you have cooked quinoa on hand, this dish takes less than five minutes. Choose raspberries at the height of their season or sub in any other berry you find at the farmer’s market. Blueberry quinoa bars make an excellent breakfast on the go. Bake once, then have breakfast all week long: sounds like the perfect, time-efficient way to avoid that emergency coffee shop run before work. Freezer-friendly egg muffins are an ideal breakfast to make in bulk; simply take them out and reheat as needed or use for a buffet brunch option. These handheld treats are fun for kids to eat, and the beloved flavor combo of sundried tomatoes, spinach, and feta is one that few adults can resist as well. 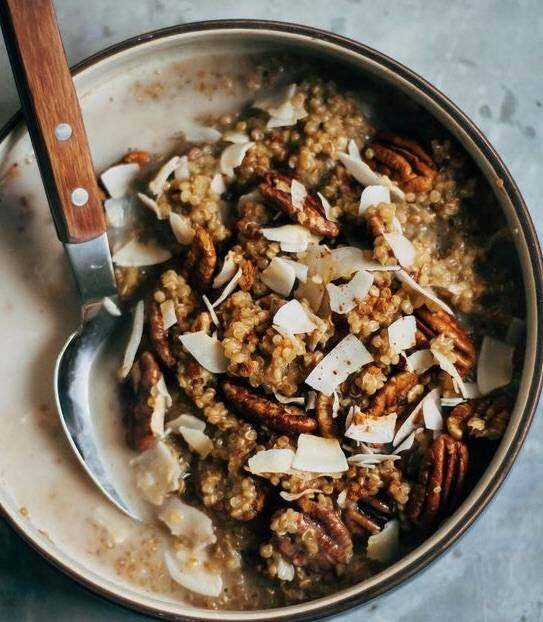 You can multitask and skip your daily caffeine fix when you make this breakfast quinoa. Steeping a bag of chai tea in the almond milk will give you an energy boost as well as add a slightly spicy, rich taste and aroma. Nuts and coconut get mixed in for additional layers of flavor and texture. This quinoa breakfast bowl only has seven ingredients, but when dark chocolate s featured, how could you possibly go wrong? Rich and amenable to being topped with fresh fruit, coconut shavings, or whatever else you desire, it’s a decadent flavor feast with a healthy foundation. Spice up your breakfast routine with this savory and spicy breakfast casserole. Cheesy and eggy, it is a sumptuous dish to serve at brunch or whenever you feel like a flavorful alternative to the cereal and milk routine. We don’t know a soul who could resist a stack of fluffy, fruit smothered pancakes. Quinoa adds crunch and protein in this delectable version that looks easy like a Sunday morning. Easing into your quinoa game? Try this yummy looking coconut quinoa granola; it incorporates chia seeds and quinoa without overpowering the more traditional granola taste. We have a feeling this is going to go fast, whether you eat it with milk, topped with yogurt, and fresh berries, or simply out of hand as a mid-morning snack. A veggie-packet breakfast skillet with eggs is a no-fuss, basic recipe, and that’s how we like it for days when we need lots of protein power, but don’t have extra time to linger in the kitchen. Swapping out seasonal vegetables and adding varied spices will keep this breakfast feeling fresh and current throughout the year. Caco nibs, coconut, sunflower seeds, and,quinoa? There’s a lot to love in these filling breakfast muffins. This recipe just may be the one to win over the quinoa suspicious and averse. The only tricky part to overnight quinoa is actually remembering to make them the night before. For a seriously no-brainer breakfast that makes quick use of any leftover quinoa, just mix the ingredients together and then let chill overnight in the fridge. You can hit the snooze button a few times knowing a cool and creamy breakfast awaits you. The combo of textures in this dish makes it irresistible. The added crunch from baking and the pistachios , the sweet and soft cooked fruit, a creamy dollop of yogurt, and the satisfying chewiness of the quinoa make this dish a seasonal celebration. Muffins are among our breakfast staples, so we had to include a second option. Stuffed with prunes, dates, and coconut, these vanilla coconut quinoa protein muffins will power you through your mornings. An all-in-one (and tasty) breakfast option. Sometimes you need a break from sweet. This savory pesto quinoa bowl could easily double as lunch or dinner, but it’s simple enough to throw together for breakfast and hearty enough to replenish you after a tough workout. Making gluten-free bread can be pretty intimidating and typically involved all sorts of starches and other ingredients that require a trip to a specialty store. This easy-to-adapt recipe requires only a handful of ingredients and a quick spin in a high powered blender before baking. Toast a few slices for breakfast, slathering on your favorite nut butter, jelly, or a drizzle of honey. Cookies for breakfast? We can handle that, and we’re sure our kids can too. Behind all that delicious cinnamon and molasses-scented handheld treat is sneaky quinoa, fueling your whole day. A great brunch option for our fit foodie friends. Tomatoes, feta, and spinach add pops of color and bursts of flavor; plenty of eggs make this double protein powered dish a winner for those who want to feel full without being weighed down by refined carbs.